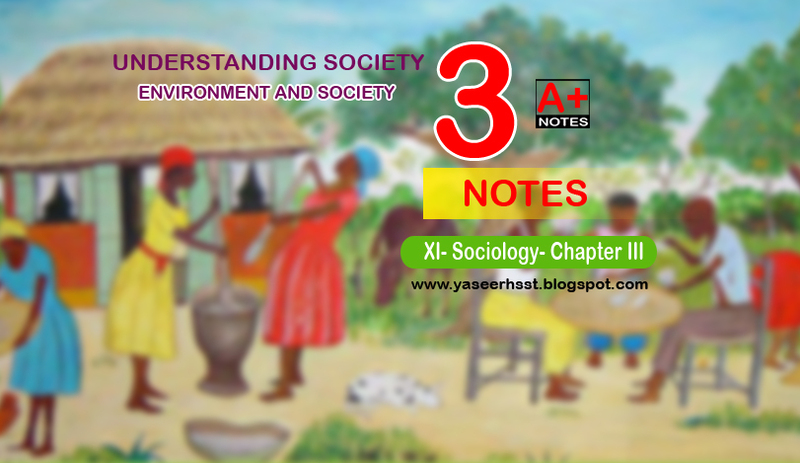 · In this chapter, we will study social relationships with the environment as they have changed over time and as they vary from place to place. · All societies have an ecological basis. · The term ecology denotes the web of physical and biological systems and processes of which humans are one element. · Mountains and rivers, plains and oceans, and the flora and fauna that they support, are a part of ecology. · The ecology of a place is also affected by the interaction between its geography and hydrology. · Social environments emerge from the interaction between biophysical ecology and human interventions. · This is a two-way process. Just as nature shapes society, society shapes nature. Ex. Indo-gangetic plain has dense population due to availability of fertile soil for cultivation. Where as hilly areas have thin population due to difficult terrain and climate. Ex. Capitalist commodity producing society has transformed lives and nature. Air pollution, commercially exploiting natural resources like forests, natural oil, water impacts nature. o e.g. if forests are owned by the government, it will have the power to decide whether it should lease them to timber companies or allow villagers to collect forests produce. o for example - the values underlying CAPITALISM have supported the COMMODIFICATION of nature, socialistic values of equality into another. e.g. Bacillus Thuringiensis have been introduced into cotton species, making it resistant to the bollworm. · Human relations with the environment have become increasingly complex. With the spread of industrialisation, resource extraction has expanded and accelerated, affecting ecosystems in unprecedented ways. o Traditional use: drying crops, clothes, fuelwood, and others. o • Natural: Soil erosion, solutions of mineral in water, rain water, storms, earthquake, seawater intrusion, dust/dirt falling from atmosphere, deposition of animal wastes and fallen leaves etc. o Composition of atmosphere N2: 78%, O2: 21%, Other gases: 1% e.g. Argon, CO2, H2, He, CH4, O3, Neon, CO, NO2, NH3 etc. § Industrial emissions: iron and steel manufacturing, oil refining, brick factory, cement factory, chemical and petrochemical operations, pulp and paper industry, fertilizer plants, thermal power plants, textile industry etc. o Noise pollution: unwanted sound which produce undesirable physiological and psychological effect. § New techniques of gene-splicing allow scientists to import genes from one species into another, introducing new characteristics. § Genetic modification may also be done to shorten growing time, increase size and the shelf-life of crops. · Social ecology refers to the fact that social relations ie organisation of property and production, shapes how environment is understood and used. · Social status and power determine to what extent people can protect themselves from environmental crises or overcome it. · Securing the public interest e.g. construction of dams or commercial exploitation of forest for timber may actually serve the interests of particular politically and economically powerful groups but hurt the interests of the poor and politically weak. · Different social groups stand in different relationships to the environment and approach it differently. o e.g. A forest department geared to maximising revenues from supplying large volumes of bamboo to the paper industry with view and use forest very differently from an aritisan who harvests bamboo to make baskets. Their varied interests and ideologies generates environmental conflicts. o Thus environmental crises have their roots in social inequality.